When planning your Saddle River relocation, Booth Movers will guide you each step of the way for a seamless moving experience you can trust. Since 1945, our BBB-accredited Saddle River movers have provided some of the area’s most prestigious local, long-distance, and international moving services. To learn more about what makes us the leading northern New Jersey moving company, read on for detailed information about our comprehensive relocation solutions! At Booth Movers, we strive to meet or exceed your every relocation need by providing a wide-range of award-winning services. Our ProMover status and Atlas Van Lines affiliation connects our team with a global network of moving and storage professionals, allowing us to complete your move on-time and on-budget, no matter how complex your relocation. Whether you’re moving across town or internationally, our East Rutherford moving services provide for your every need, start to finish. To learn more about our high-quality, comprehensive relocation solutions, visit the links below! Residential Moving – Our team of experienced moving professionals will seamlessly manage your residential relocation offering customizable, detail-oriented services you can trust. Household Moving – From apartments to large manor homes, Booth Movers is equipped to handle all household moves regardless of size or complexity. Local Moving – When moving within the Saddle River area, our local northern New Jersey movers have the tools and experience you need. Long-Distance Moving – Moving long distances is safe, affordable, and hassle free when you go with Booth Movers! Interstate Moving – For the best interstate relocation experience possible, Booth Movers is the name our customers know and trust. Full-Service Moving – Every detail of your move is handled with expert care when you go with our comprehensive packing and moving solutions. International Moving – Connect with our global team for a hassle-free international moving experience like no other. Commercial Movers - When searching for reliable Saddle River commercial movers, it’s important to find experienced professionals with the resources and experience you need. Specialized Movers - When moving delicate, large, or awkwardly-shaped items, the specialized relocation professionals at Booth Movers have the resources and expertise you need. 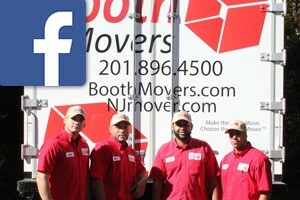 Would you like to learn more about what makes Booth Movers the leading standard for East Rutherford moving companies? Give us a call today, or complete our simple online form to request a free moving estimate!